One my dearest friends and mentors Sandy Huth and I used to teach our 9th graders about Odysseus’ tragic flaw of hubris every fall while studying The Odyssey. We used to explain that hubris is excessive pride in one’s abilities, and we would make the case to our students that Odysseus’ boast to Polyphemus and braggadocio as leaves the island of the Cyclopes were the initial instances of his hubris and thus the impetus for Polyphemus’ curse, Poseidon’s request for revenge, and the beginning of years of exile from Ithaca. His continued hubris becomes especially painful in Book XII when Odysseus tries to argue with Circe about the necessity of succumbing to the fate of Scylla, the will of the gods. I’ve mostly viewed hubris as vanity and arrogance, although its origin in ancient Greek belies much more nuance than that. The story of The Odyssey is the story of the passage of time. Time and hubris become dependent variables. Only the punishment of lost years will atone for Odysseus’ initial hubris; his hubris (primarily manifest in his desire to control his own life rather than submit to destiny) gradually diminishes as he loses all his men and resources as time goes on. Only then do the gods enable Odysseus to return home. If there has been a theme—or lesson—in my life this week, then this would be it. So every once in awhile I just have to stop myself and remember that, ultimately, none of it matters to what we’re doing in our little homeschool model. In fact, one of the biggest reasons we wanted to school at home was to remove our children from competitive learning environments. Learning should be fun, done for yourself (internal motivation), valued at a much deeper level than grades or beating someone else, and open doors to lifelong passions. We want to meet our children on their timetables—albeit, with definite guidance. We offer various extra-curriculars repeatedly even after a couple of refusals (just like a new food when they were little), and we encourage practice and commitment but also exploration. We put up the resources, and we make suggestions. We have definitely discovered that the one-on-one or one-on-two homeschool model naturally facilitates academic advancement, for us, in many areas. That student-teacher ratio is very important, we believe. Yet we did not, and still do not, believe that we are homeschooling with the intent to have our children finish their schooling in their early teens. Mastery of subjects never ends. 😉 Rather, we wanted the flexibility to meet them wherever they happen to be—whether at a slower pace, or a faster one. Their timing. Their natural timing, with our guidance. So why do I catch myself still trying to control this timing, like Odysseus, once in awhile? Do I have the hubris of Dr. Victor Frankenstein who, in giving electric birth to his nameless monster, sought absolute control of a thing of his creation (and failed)? If so-and-so walks at x months and so-and-so is designing rockets by age y, what—really—does it matter? There is a right time for everything. There is a right time for everyone. Being a mom of more than one child has helped me to mellow out a bit in this respect. I’ve learned with Katie that all things—giving up the pacifier, for example—work themselves out eventually, and yes, sometimes with a bit of an assist. This has made me less fretful with Eric and more comme si comme ca; the trick now is to learn to apply this lesson to Katie herself as she pioneers our way through the elementary school years. 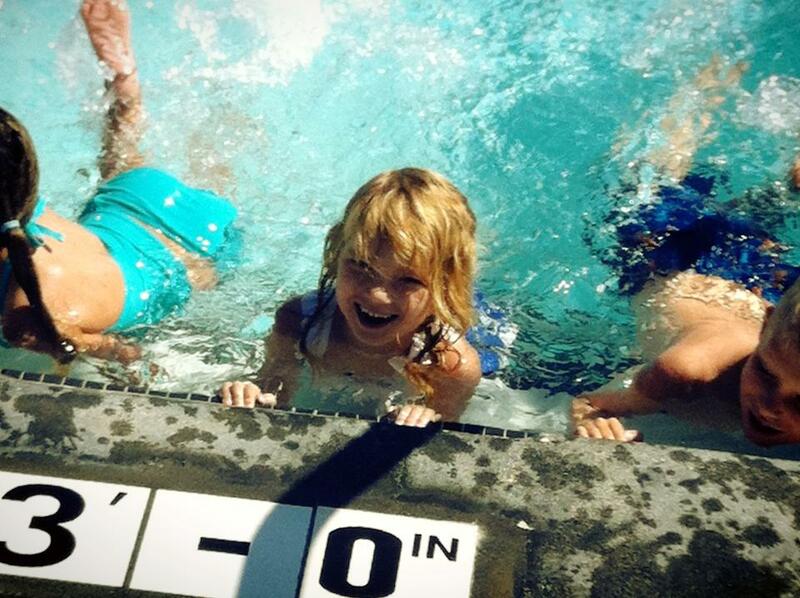 Still, I was in distress two years ago when I enrolled Katie in her first independent swim class at age 3.5. She was so excited the first day but part way through class, she began to slip off that little platform attached to the edge of the pool where they have the little kids stand. Someone got her right away, but she was scared. She came crying out of the water and refused to go back in. We showed up for class every day for the first week and, although she would not go in, we watched class because we had made a commitment. As a mother, it was painful. The night before every class, she was confident she would go in the next day. I would get my hopes way up, and then she would not even put her feet in. At the time, it felt like every 3.5-year-old was learning to swim. We tried cajoling, taking things away, pleading, bargaining. Nothing could persuade her. I felt like I had failed to get her through this milestone that all other 3.5-year-olds were accomplishing. Nevermind the fact that I had learned to swim at age six. It’s all about doing everything as early as possible these days, right? Wrong. It was a big lesson as a parent. Listen to my child. Ignore the other stuff. It wasn’t meant for us. We didn’t approach formal lessons last summer (4.5 years old). It wasn’t the time. For either of us. A few months ago, Katie asked me about swim lessons. Really? I signed her up, but my stomach was in knots for weeks every time I thought about it. What if she found she still did not want to get in? What then? Would this be an ongoing life issue? What would I do to help her? How would she be mentally affected/scarred if she found herself unable to get over the fear? Would this lead to a life of fear? See how big it got. She loves her swim class. She has made friends with the other kiddos. She loves her teacher Lindsay. We’re off for the weekend, but so many times today she has said, “I can’t wait for Monday! I can’t wait for my swim class!” She has even asked to sign up for another session after we get back from our family trip. Okay, you got it. We filled up the wading pool today and she kept dunking herself. For Eric, too. We’ve been toilet training off and on since the new year. He has shown some interest, but once again, it was me who had more of the agenda (get him trained at the same age his sister trained) at times. Other times, I would completely flake out. It may seem like it would be easy since we’re at home schooling, but that is precisely what made it so difficult. I’d be in the middle of teaching Katie math, for example, and we would find ourselves in the bathroom or doing laundry every couple of minutes…which doesn’t make for very solid instruction. I like solid instruction. Or, we’d make progress on a weekend, only to realize that we had some activities during the week (um, Disneyland, I admit it) for which we weren’t ready to use underpants. I would say this: he wasn’t quite ready in January, but it was me who consistently dropped the ball for the last couple of months at least. And then he proceeded to train himself. I really haven’t done a thing. We don’t use reward systems for potty training, just family cheering and encouragement. On the first day or two he had some accidents, so I just cleaned up and gave him reminders. One week later, and he is fully trained at home. All I do is help him on and off the toilet. When Mr. Eric makes up his mind, he does it. The next step is teaching him how to travel with underpants, but hopefully that will be as straightforward as it was with Katie. He was on his own timing. He let me know, and now here we are and it has been painless. Easier than even Katie was. He knew his right time; I just had to listen. It’s okay to be slowed down. It’s okay to wait until the moment is right. “To everything there is a season…,” yes? It’s okay to embrace natural timing. Sometimes life works out even better when we do.